While this should have been done long back, it is good to see that it has now been implemented! Infact, now every a passenger can complaint via an SMS, a phone call, a mobile app or through internet. Let us look at each in detail. 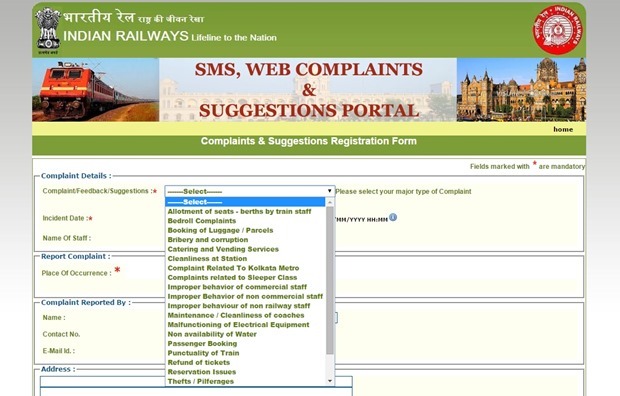 Passengers who wish to complaint online can visit http://www.coms.indianrailways.gov.in/. Through this portal they can give suggestions, register complaints and also track the status of their complaints and suggestions. The good thing is that complaints are available in every possible category including bedroll issues, cleanliness, improper behavior, passenger booking issues, thefts and such. To ensure that action is taken on every complaint, the portal also has a tracking system. Once you file a complaint, you get a unique complaint number through which a passenger can track the status of their complaint. Alternatively, the complainant will also receive a message on their registered mobile phone and via email about the action taken on the matter. The mobile app is currently available on Android and you can download it from Google Play Store. The functionality offered by the COMS (Complaint Management System) app is exactly the same as in case of the web portal. A passenger can register complaint, give feedback and track their complaints directly through native mobile app. One interesting feature about mobile app (as well as portal) is that you can add attachments to your complaint. So lets say you want to complaint about dirty coach, you can immediately snap a picture and attach it as a proof. This can be incredibly useful in many cases. Note: We tried download the app, however, when we tried it gave us an error stating that “This app is incompatible with all of your devices.” The authorities need to make sure that the app is compatible with all the phones! In the recently announced Railway budget, the minister had also announced dedicated helpline for Railway customers. They can directly call 138 from their phone for any complaints or suggestions. Also, if there are any security issues, passengers have to call 182. Millions of Railway passengers are going to be extremely happy with the steps taken by the Indian Railways. However, it will be important to see how fast the action is taken on the complaints raised by passengers. The last thing we need is that no one pays attention to the complaints raised, and no action is taken! Do install the app on your smartphones and next time you travel, make sure you complaint if you see anything wrong! 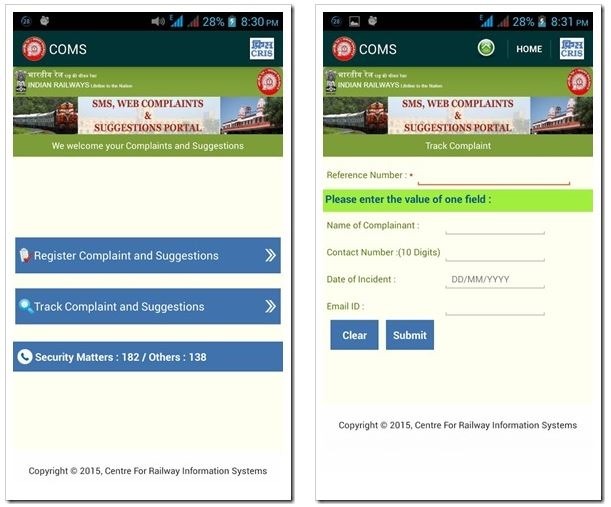 "Indian Railways Launches Web Portal & Mobile App For Passenger Complaints", 5 out of 5 based on 1 ratings. I am sending this mail from Australia where I am right now. I am an Indian Passport holder visiting my son in Australia. I called up a friend of mine to book a 3rd ac ticket from Kochuveli station to Krishnarajapuram for my journey on the 31st of January by train no 16316. I am a senior citizen aged 67 and while furnishing the details my friend in India typed the actual age, but in the display they mentioned that senior citizens quota is over and they themselves made me young by 10 years and issued a ticket without the senior citizens benefit. This was thrust upon me. Had it been known earlier, I would have gone for 2nd sleeper. This is a clear loot by you Guys and I am going to expose this to the general public through social media and also moving the Consumer Protection Council to file a petition for refund of the difference amount with cost. I expect a reply from you within 24 hours. service and information portal now introduced is worst and complicated..previous portal was user friendly and easy.. please revert to previous one..
1. Keep passangers informed of their consumeratic right to receve and pay right. 2 In each compartment paste menu rates prominently and non erasable , besides a rate list be available with every vendor to be given on asking. 3. Plan to effect payment digitally or through ewallets. Railway ko 1 improvement ye krni chahiye ki her dibbe m dustbeen ho taki log unka use kr ske dustbeen na hone k kaaran unko kachra baher fakna hee pdta h agr dustbeen dibbe k ander hee hoga to shyd log khachra baher na failayenge jisse gndgi bhi ni hogi modi ji ka sapna sach ho skega swach bharat abhiyan ka jis prakar indino trains m mobile charging ki suvidha di gyi h usi prakar dustbeen bhi hona chaiye ….. The website is not working. It is just to fool the public. As modi fooled the people of india. Its just an attempt to fool public..
My complaint is pending for almost a month so what is the use of this complaint portal if no one replies ? will there be prompt replays to the complaints that we make? They Don’t respond head weight people. I complained regarding bad maintiance of qnd AC coach no one respnded.Even I sent mail to Railway monister no response. What is the use of setting up this website when no one replies ? I gave one complaint on 04.03.2015 but till now its showing pending. If you keep one simple complaint pending for more than a week then what is the point in launching this website and invest public money to fool public ?